The Browns are an up-and-coming family group which got its start in Iowa. Although, not a household name in Southern Gospel, many listeners will recognize their music. They’ve received national attention in the past several years, and performed on the NQC mainstage several times last week. I’m a somewhat new fan of the group myself. I started listening in 2011 when I heard their single "Good Enough" on the radio and then tracked down their album Now. Since then I’ve also listened to the first volume in their Heritage Hymn Collection series. The music that I’ve heard, for the most part, has been rather traditional, a mix of Southern Gospel and hymns. That is until they released their newest CD, Love Loud, this month on the Stowtown Records label. Stylistically, nearly half of the songs on Love Loud can be defined as moderately to very progressive. The opening title track for example is a fun, upbeat song driven by electric guitars. It encourages us to "love loud, love long" if we want to make a difference in people’s lives. "Street of Gold" is a hard-driving pop/rock-infused song which Joseph Habedank co-wrote with Wayne Haun and Adam Brown. "Everything Changes" has a pop-ish/contemporary feel, and "River in the Rain" almost sounds like something that Casting Crowns would do. I enjoy the new sound. The group is trying new things, but they haven’t abandoned the Southern Gospel sound that got them where they are. There’s something for everyone on this album. While half of the recording is more-or-less progressive, the other half is distinctly more traditional. "Rock and Redeemer," penned by Wayne Haun and Joel Lindsay is the group’s current radio single. It’s a solid upbeat tune led by banjos and guitars. A couple of the other up-tempo songs are more traditional as well. Love Loud doesn’t have much in the way of slow songs. Only two out of the twelve tracks. The first one is "The One Who Still Works Miracles," a huge power ballad led by Shelley Brown. I wouldn’t be surprised if this became the group’s next single. The other slow song is "This I Know, " a nice acoustic tune that blends the classic "Jesus Loves Me" with a newer song penned by Wayne Haun and Sue C. Smith. It’s my favorite of the two ballads. Besides their music, I was impressed by the fact that the Browns are talented songwriters and musicians as well as singers. 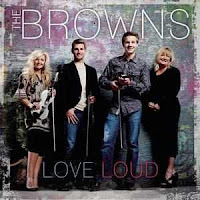 They co-wrote five of the twelve songs on Love Loud, and the three kids--Adam, Andrew, and Michaela--played their fiddles on the last song, a medley of "All Hail the Power of Jesus’ Name" and "Crown Him With Many Crowns." I would definitely recommend Love Loud, but probably not to those who are strictly conservative with their music tastes. If you’re like that, then you probably won’t enjoy this project. Even though there are some traditional songs, you’ll probably come away feeling like the album was too progressive. But to those who enjoy musical diversity and like their albums to cover a broad range of styles I’d say this: Love Loud is definitely loud…and definitely fun.